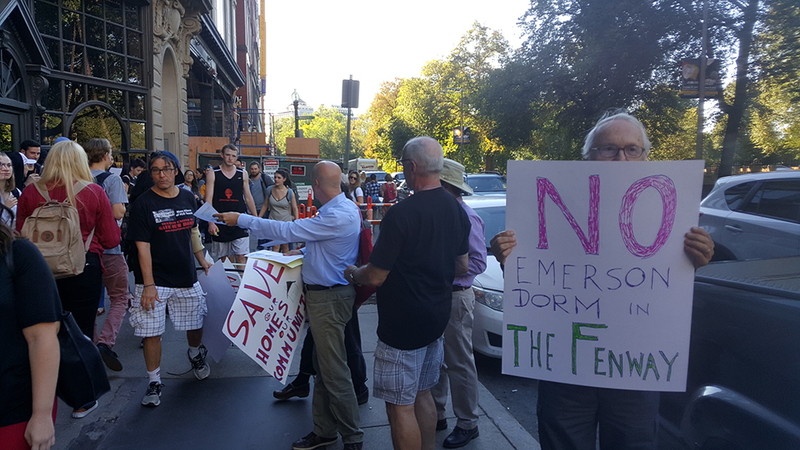 In a protest last Thursday outside of the Walker Building, about 10 members of the Fenway community voiced their opposition to Emerson’s plans to lease a residential building to house 115 students in the area for two years during the renovation of the Little Building. The protesters joined a larger crowd over rent hikes at City Hall later that day, according to the Boston Globe. John Labella, one of the protesters, is a Fenway resident of 31 years. The rent hikes, according to Labella, were pushing long-time families and workers out of the neighborhood. Labella said the college did not give residents proper notice to respond to its proposal for a hostel, located at 12 Hemenway St., to be rezoned for institutional use. The proposal has not yet been approved by the Boston Planning and Development Agency, previously the Boston Redevelopment Authority. The Fenway area is home to many college dorms—including Boston University, Massachusetts College of Arts and Design, and Berklee College of Music—that residents don’t know who to call for complaints over noise or behavior, Labella said. Emerson’s Institutional Master Plan Amendment, a document submitted to the BPDA outlining updates to its real estate plans, proposes that the Hemenway property would feature the same security features as the core campus, including Securitas officers, an Emerson College Police Department patrol, one resident director, and five resident assistants. Arthur Mombourquette, senior associate vice president for Real Estate, said there was some flexibility in the length of the lease. But he said the college has committed to finishing the Little Building renovations and moving out of the Hemenway property by fall 2019. The college is continuing to expand on-campus housing, in part so that students will not be in competition with the work force for housing, according to Mombourquette. “With the completion of Emerson’s campus building projects, the college is meeting the request of Mayor Walsh for colleges and universities to provide on-campus dormitories for as many students as possible to free up housing for Boston residents,” Carole McFall, associate vice president of communications, wrote in a statement to the Beacon. The Hemenway building has 56 rooms, 115 beds, a commercial kitchen, and a cafe, according to the college’s Institutional Master Plan Amendment. The objecting Fenway locals have collected at least 300 signatures on a petition against the lease, Labella said. The Institutional Master Plan Amendment includes letters of opposition to the lease addressed to the BPDA from City Councilor Josh Zakim, State Representative Byron Rushing, and State Representative Jay Livingstone. It also contains responses by Emerson to the legislators’ letters, and letters from Fenway residents weighing in on the issue. Labella said he and his fellow community members aren’t done fighting Emerson’s lease but declined to comment on specifics.